I did notice that across designers, there was a lot of similarity in characters. Stormtroopers, Darth Vader, R2D2 and Yoda were all pretty common – and characters from newest movie were relatively rare. Some designers did go out on a limb though and there are some pretty cool characters and designs on display in this roundup. My favorite is probably the stencil-based ones. What is your favorite? 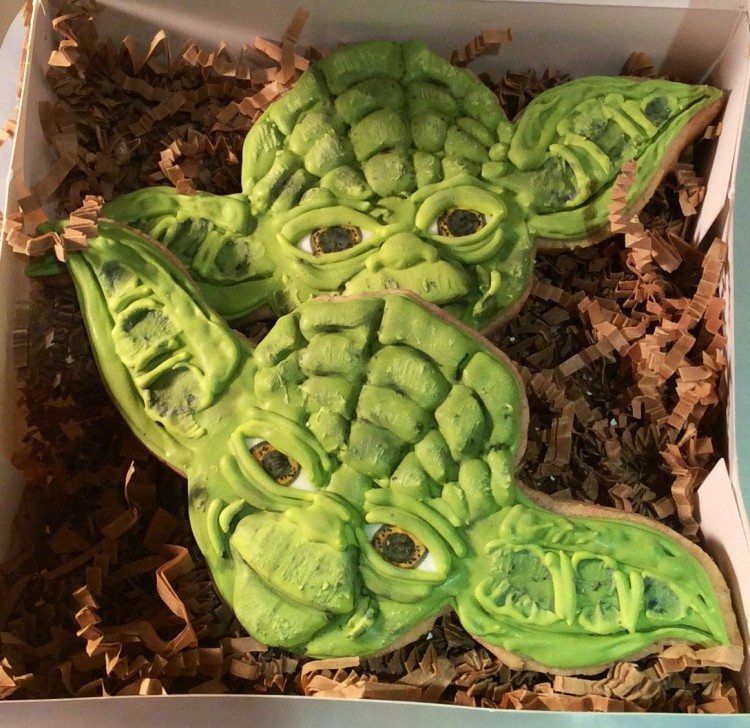 I know we're already past Christmas, but these cookies were too unique (and cool) to ignore. 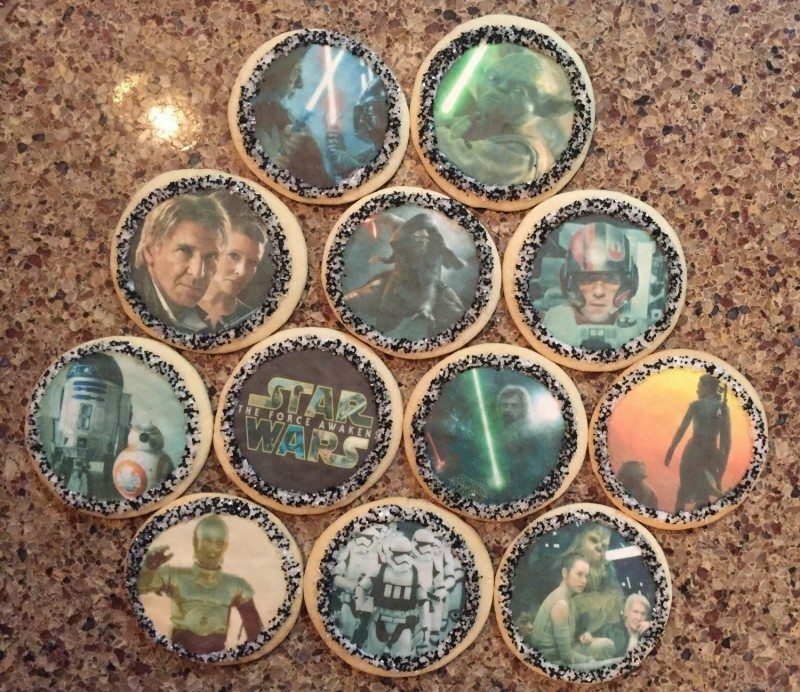 Realistically, these cookies would work well for many different occasions, but the creator calls them birthday cookies, so I will too. 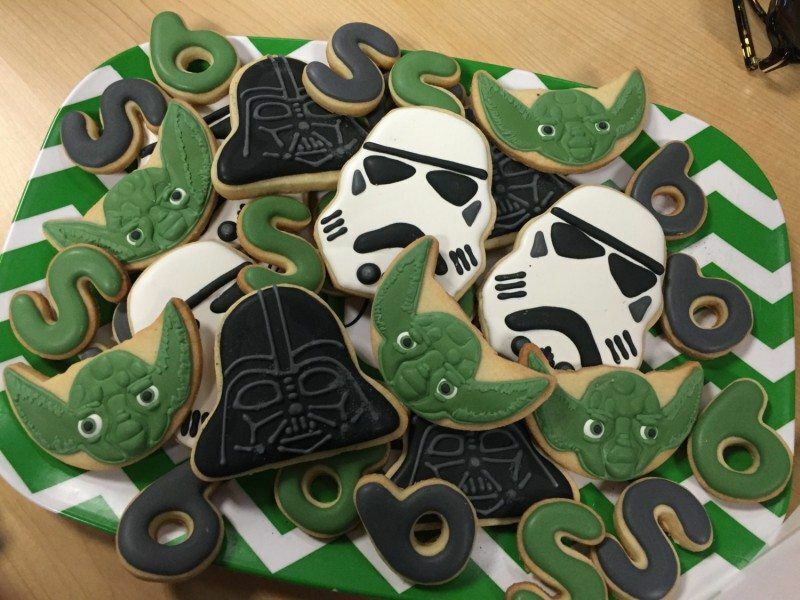 This set of cookies only comes in one design but that doesn't really matter because the design rocks. 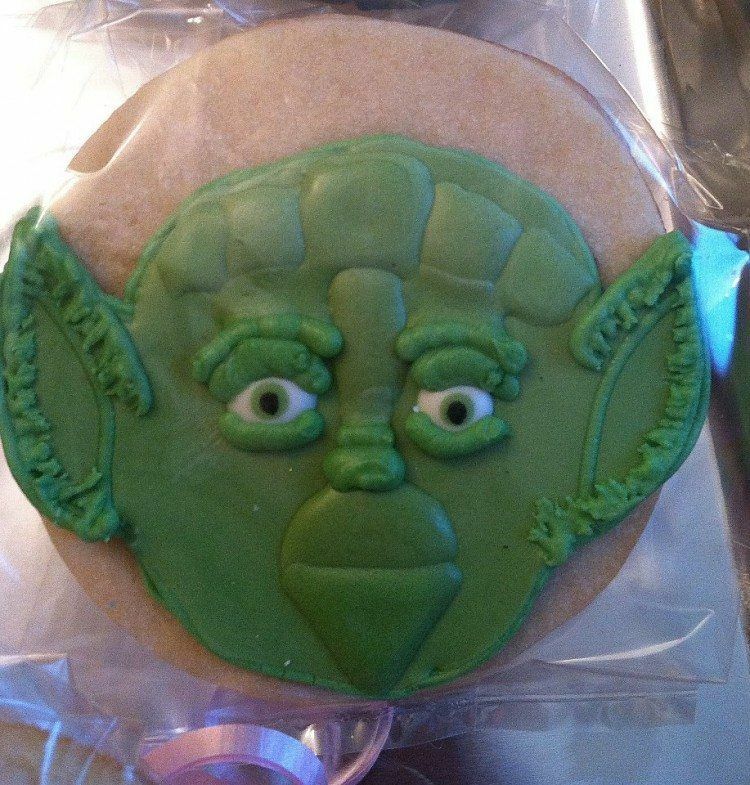 There are actually 12 different cookies that you can choose from, all from the older movies – but I picked this image of Yoda because of the detail it shows. 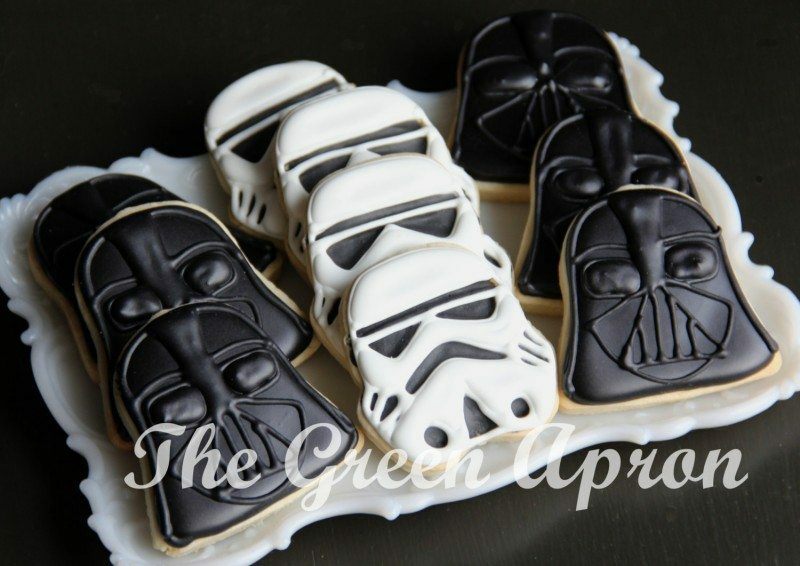 So far this is our first set of cookies that specifically gets inspiration from the new movies. 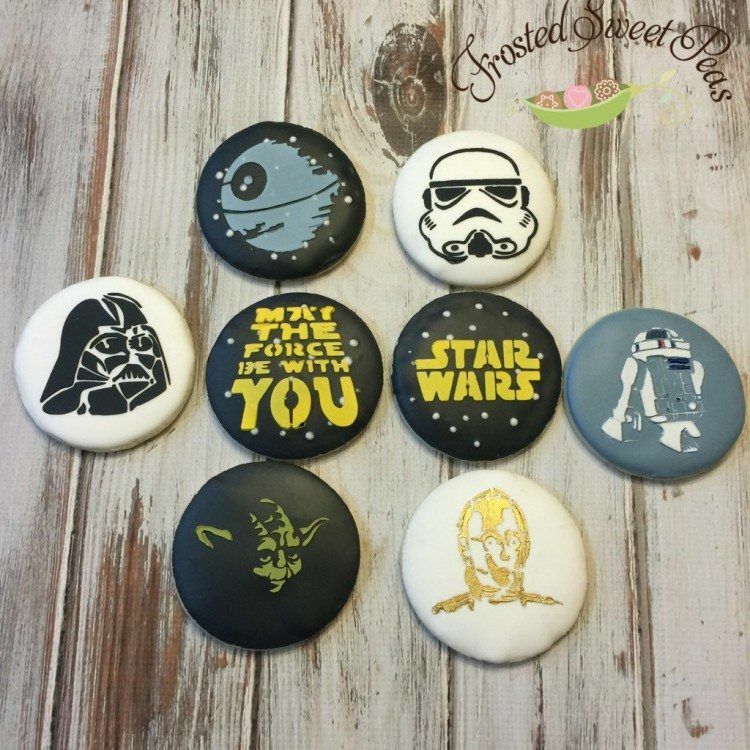 That makes these a great choice for anyone who loved The Force Awakens. 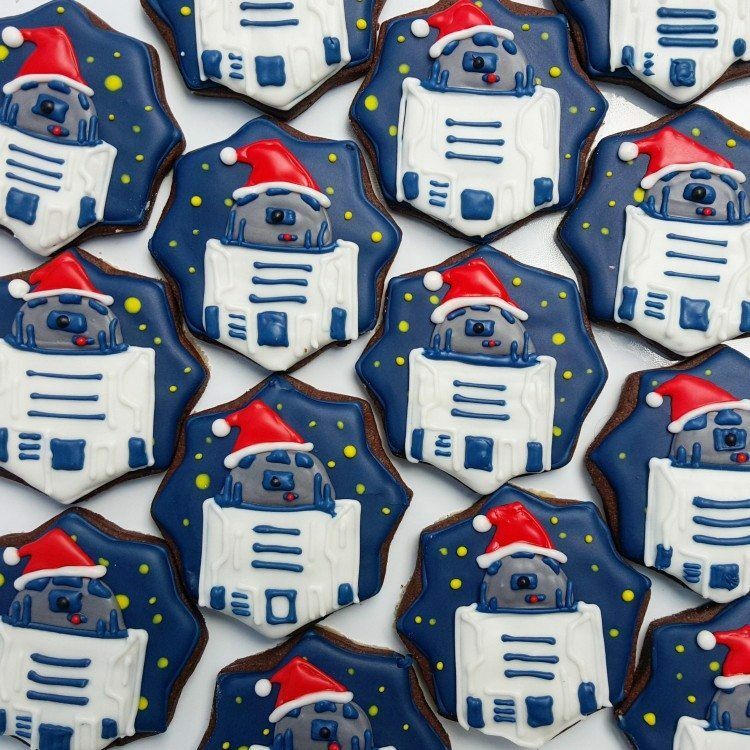 I love how the creator managed to make these cookies so recognizable, even though most of the characters and objects weren't actually round. 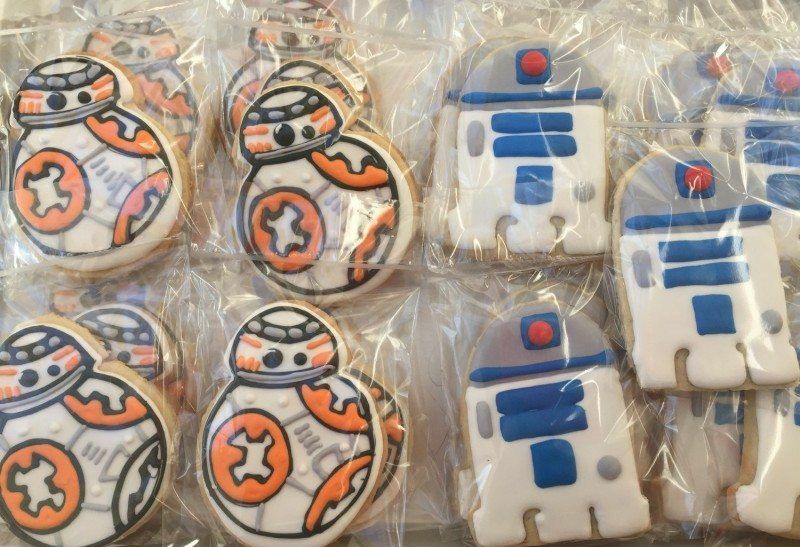 The style for these cookies is just too cute for words, but even then, the characters are still very easy to recognize (especially Leia). 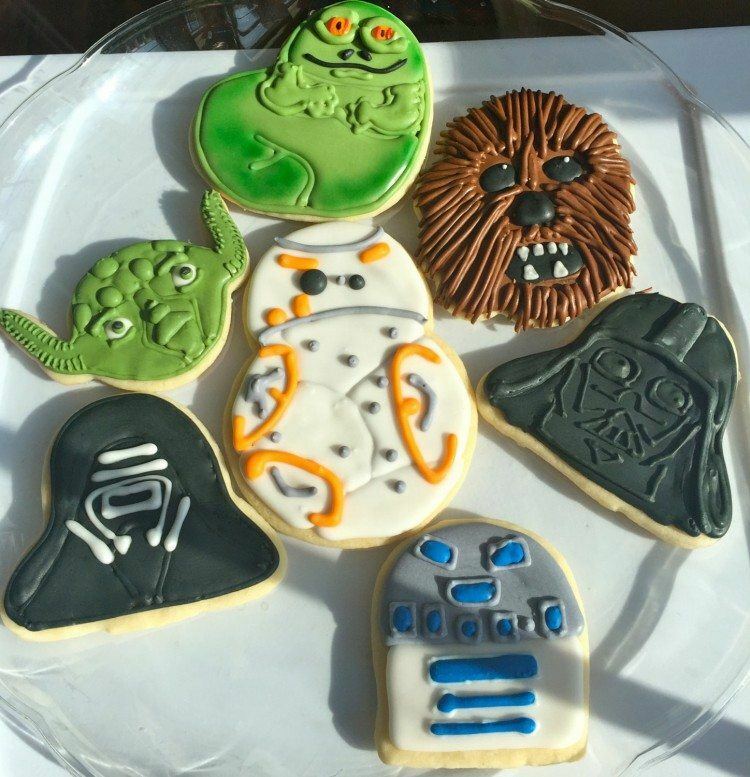 I like both of the styles for these cookies but my personal favorite is the Stormtrooper. Doesn't he just look perfect? 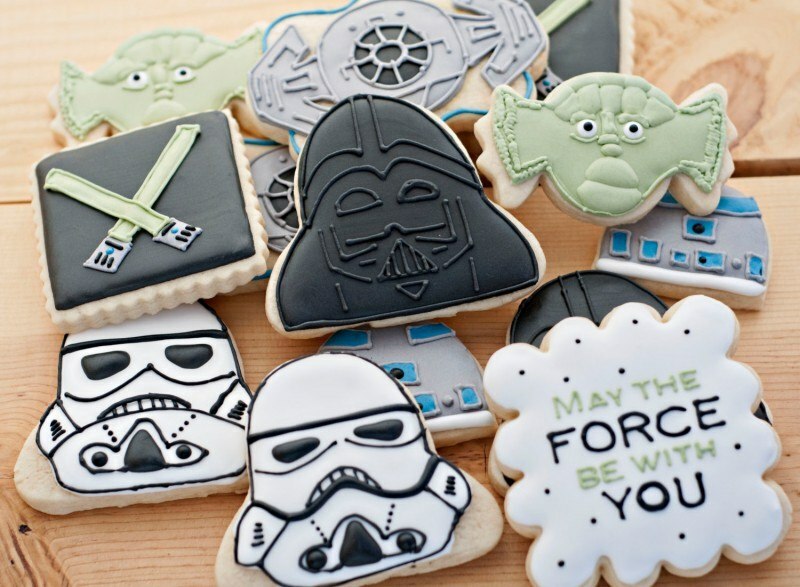 These cookies are certainly an unusual entry to this list, but they are fun if you're looking for something a little unusual. 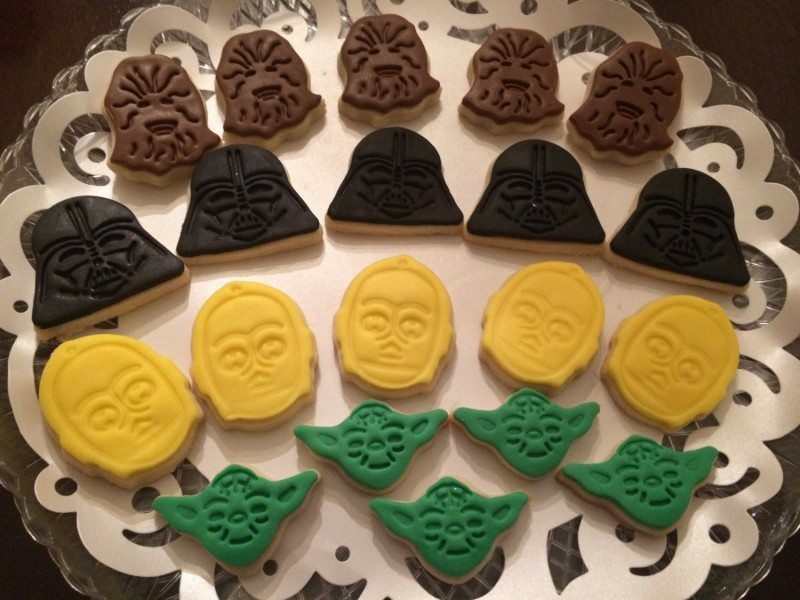 By the way, the green one is Yoda. That was the only one that didn't seem obvious to me. 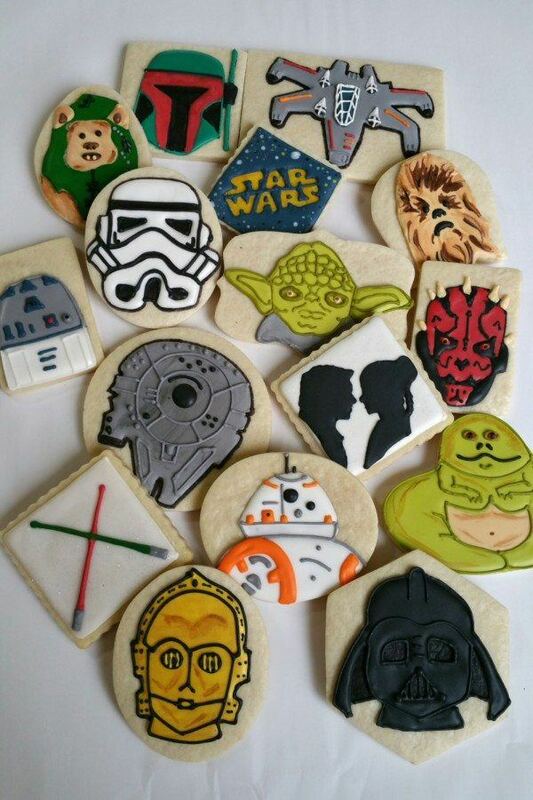 This set of cookies includes a range of different styles. They're mostly characters, but there are a couple of more unusual ones included as well. 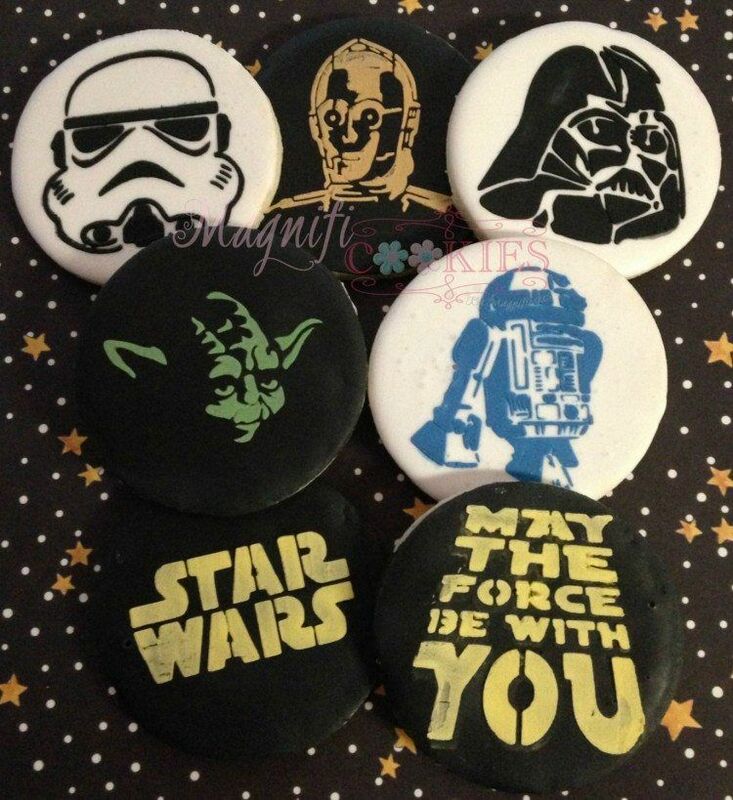 I love the style of these cookies overall and including stars in the mix is just too clever. 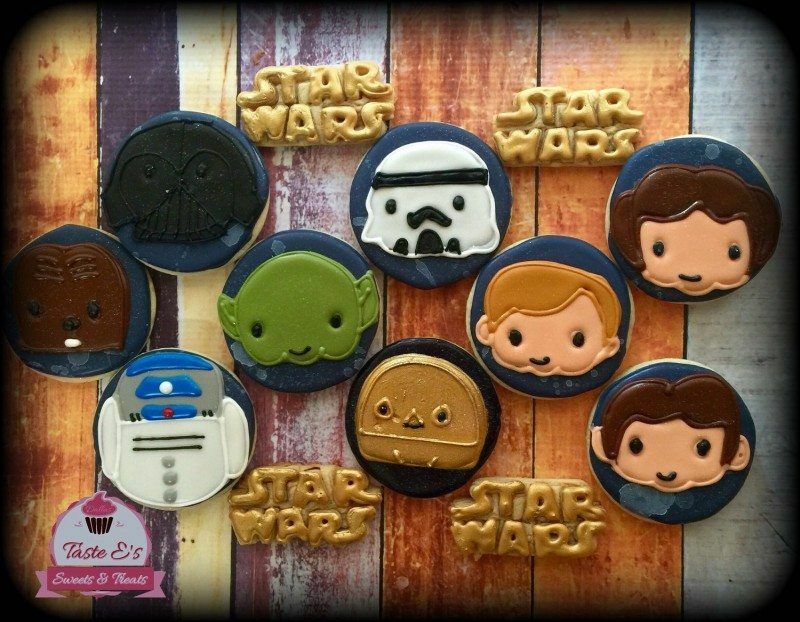 This set is cool because it contains some characters that don't seem to make it into cookie sets often, including Jabba the Hutt. 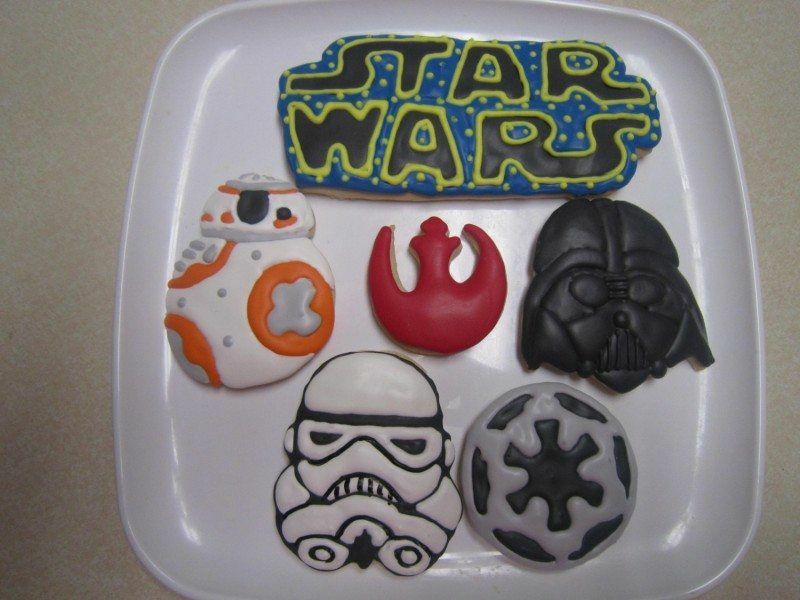 This set of cookies might only have three characters, but they are all very easily recognizable. 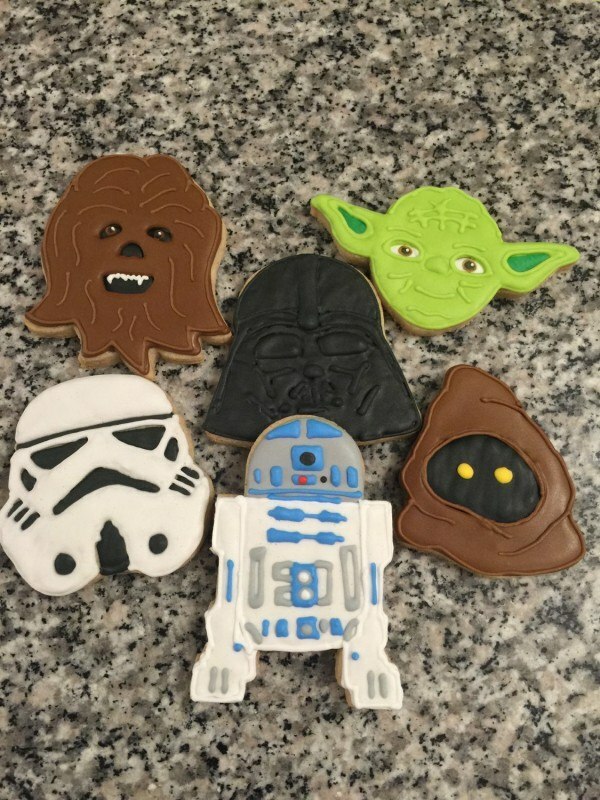 Being gluten free gives these Star Wars cookies an advantage, plus I love the choice of characters. 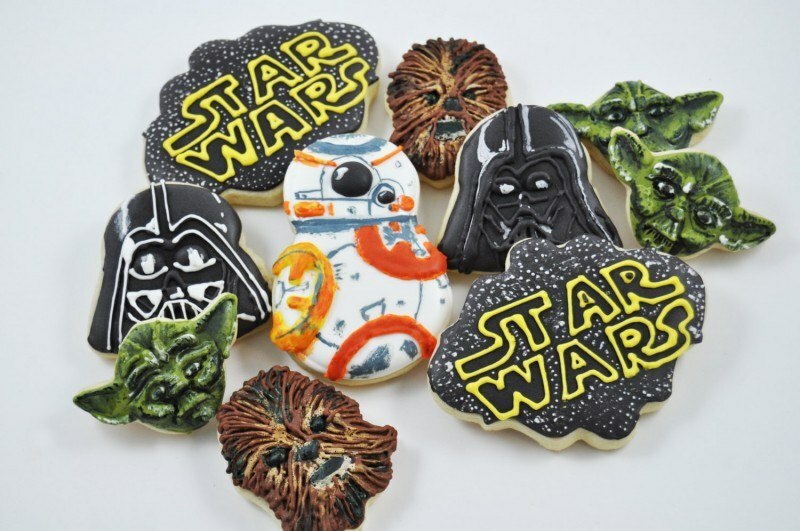 The overall style of these cookies is a little different than most others on the list, but the most interesting thing about them is that they are chocolate Oreo cookies. Yum! 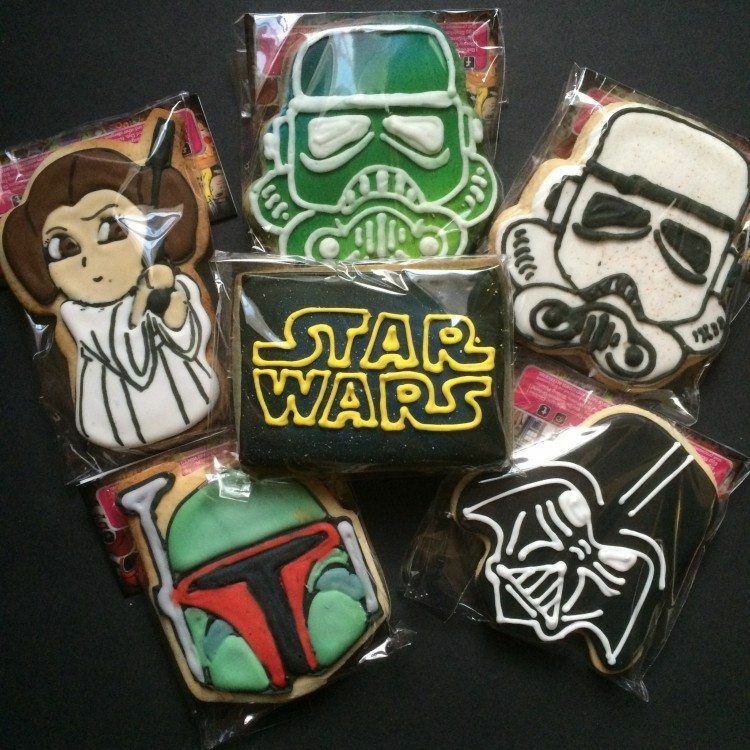 These cookies do have an unusual style, but it is still a cool set of Star Wars cookies. I particularly love the ‘May the Force be With You' quote. 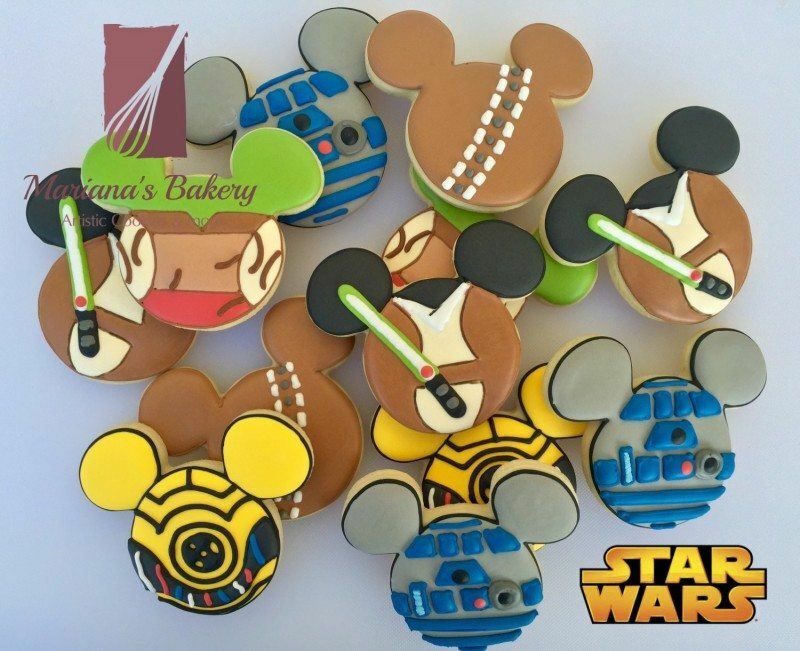 This set is unusual because it has as many logos as it does characters. Personally, I love the way the Rebel Alliance logo turned out. 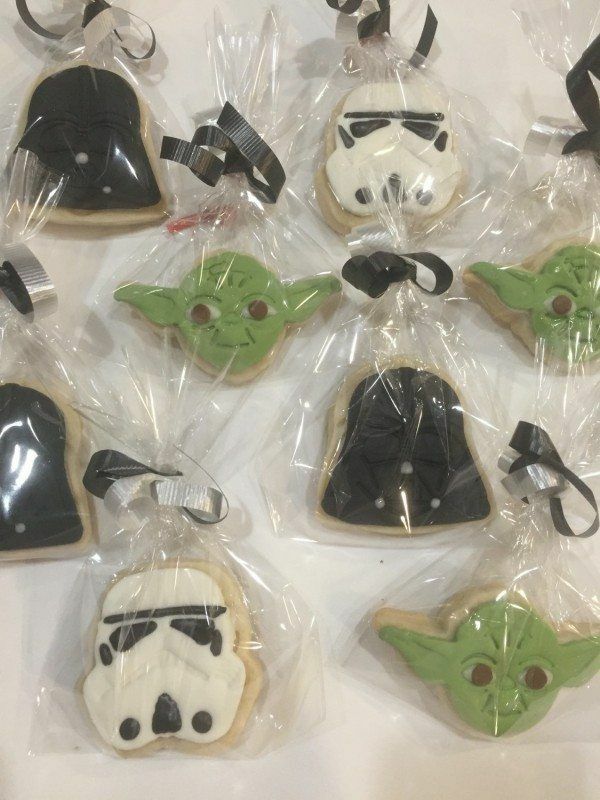 The selling point of these cookies is probably their small size, which makes them great for parties. 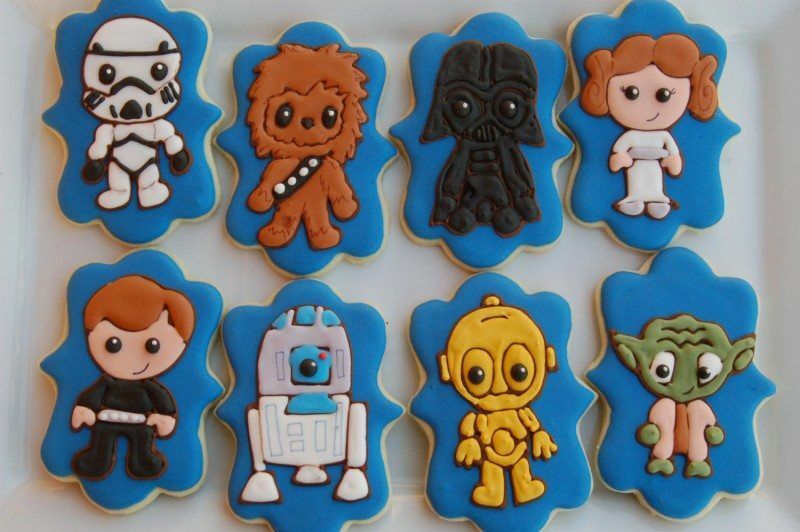 Hands down, my favorite cookie in this set is Leia. Personally, I'd love to buy a set that just contained her. 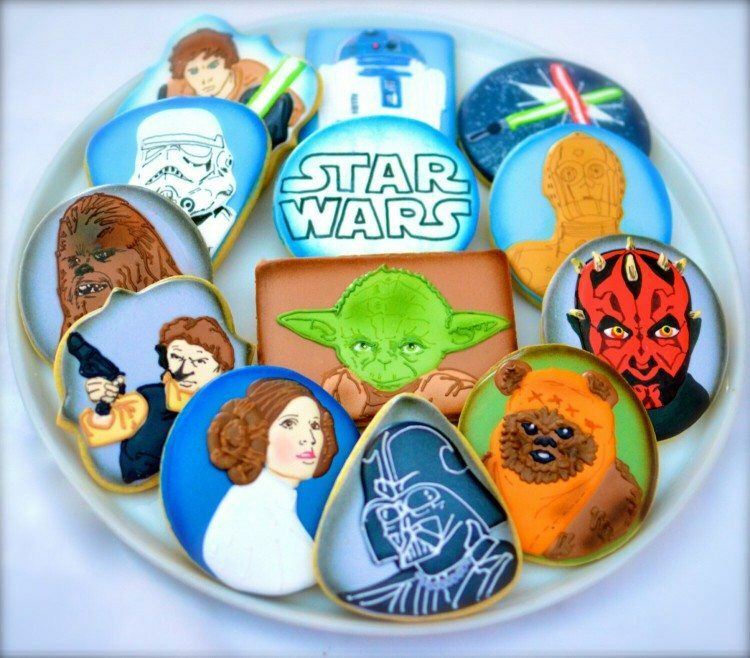 The vegan nature of this cookie set is certainly a selling point, but I'm more interested in just how detailed the designs are (especially Darth Maul). 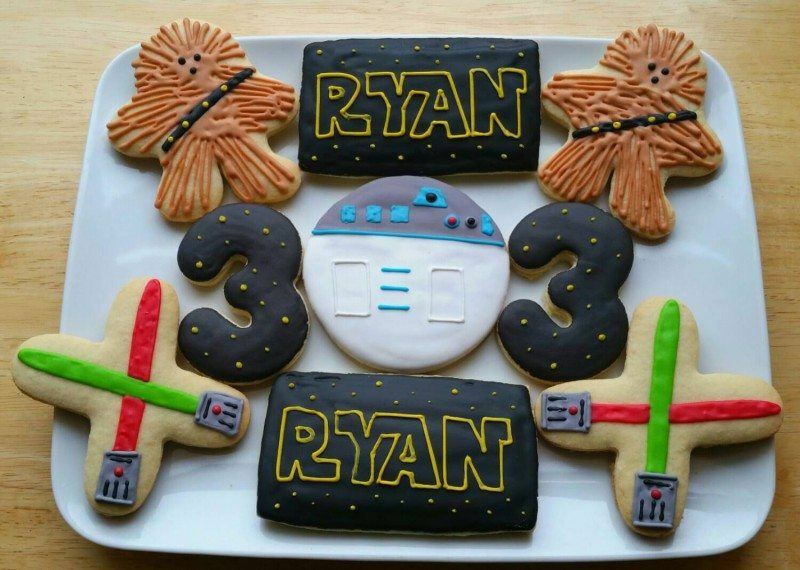 Needless to say, your set wouldn't say Ryan and have the number 3 in it. The ability to customize is pretty cool though, especially for a birthday. 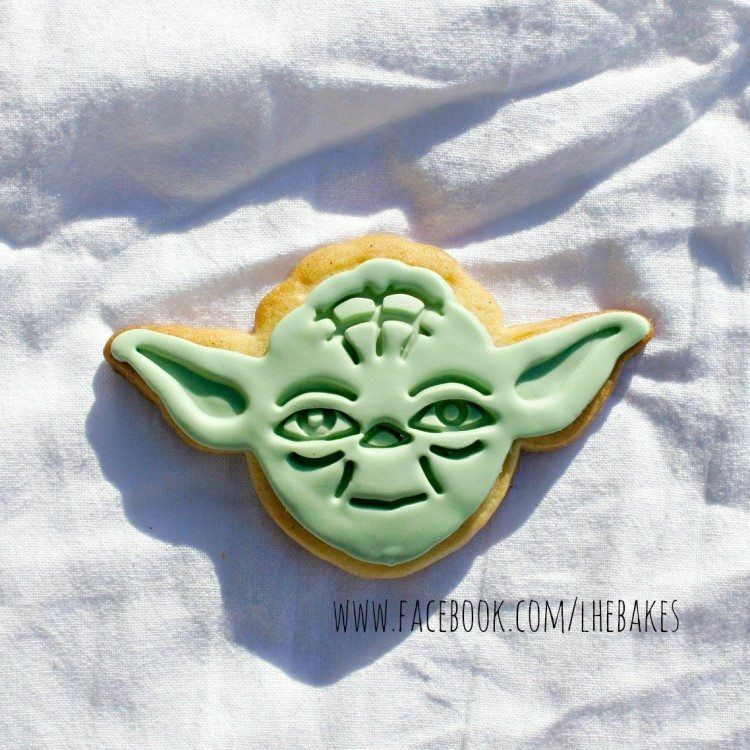 The amount of detail that has gone into these Yoda cookies is seriously impressive. I particularly love the eyes and the mouth, which make the whole thing stand out. 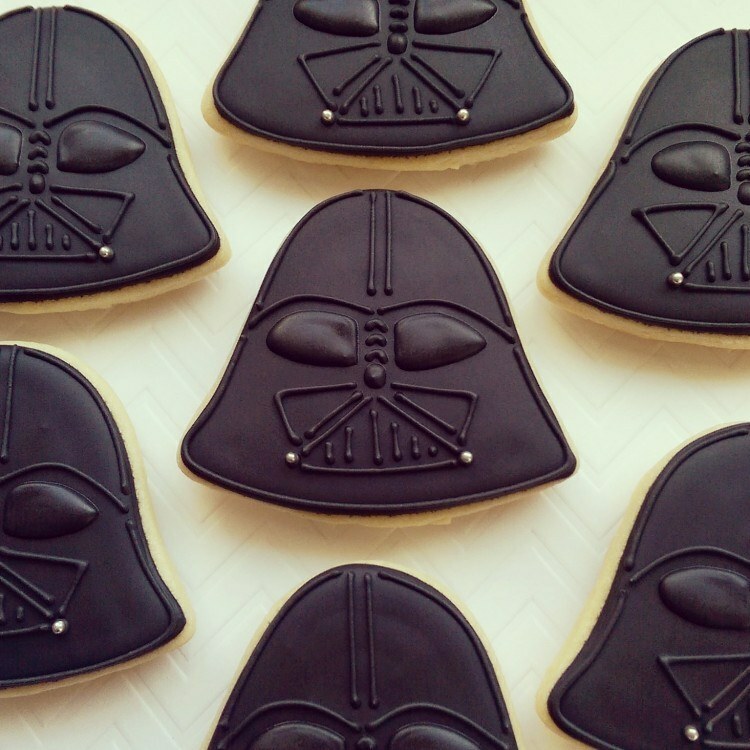 These cookies use a simple recipe, which can be a good thing. The creator also notes that you can request designs that she doesn't specify. 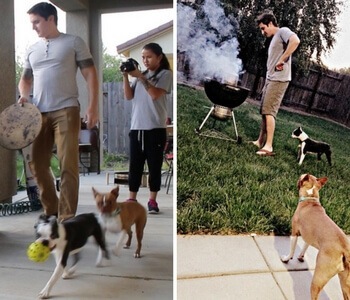 That's a pretty cool touch. 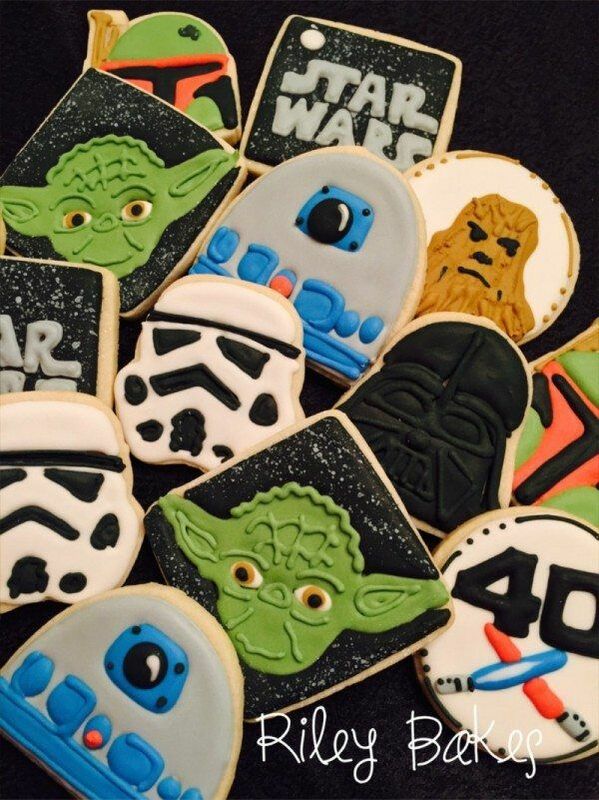 The coloring and attention to detail on these cookies is just perfect. 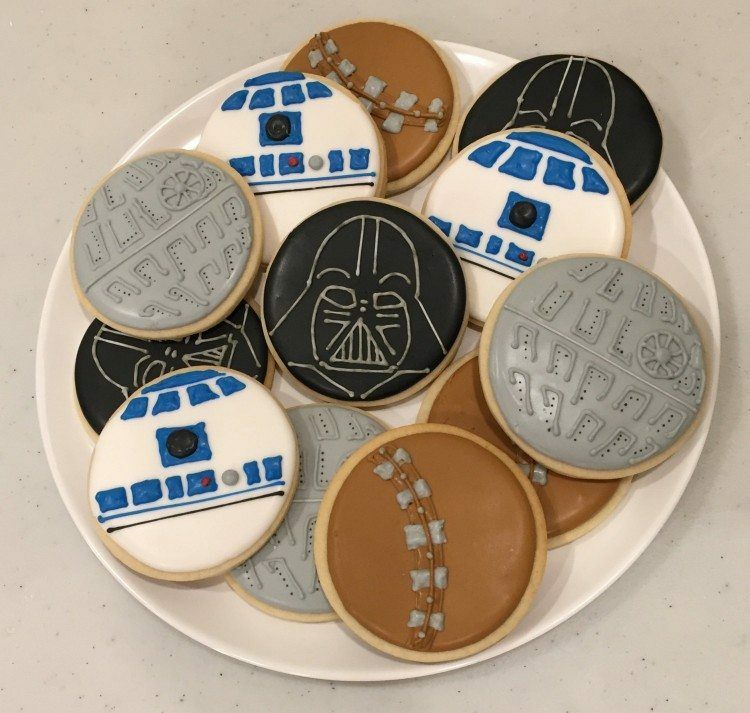 The images for these cookies are actually printed on (with edible ink), which is why they look identical to movie scenes. 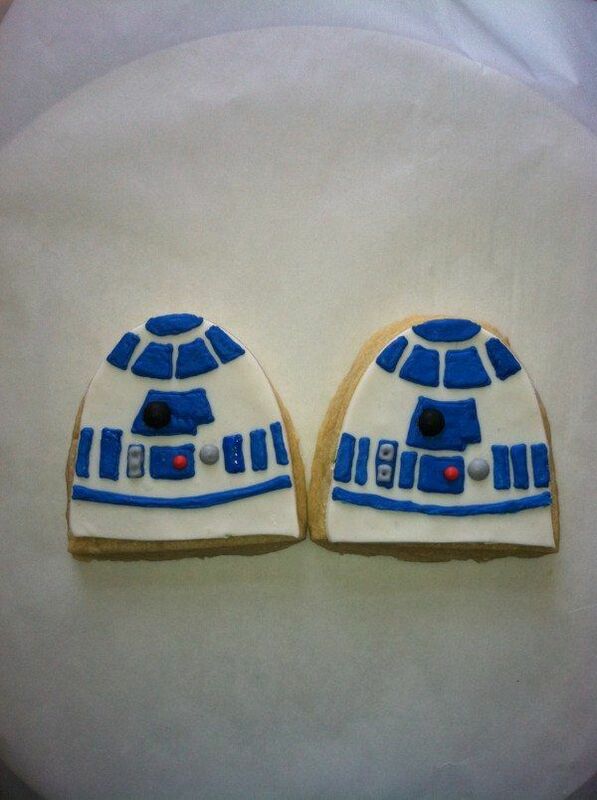 These cookies would be a perfect pick for someone who particularly likes R2D2. 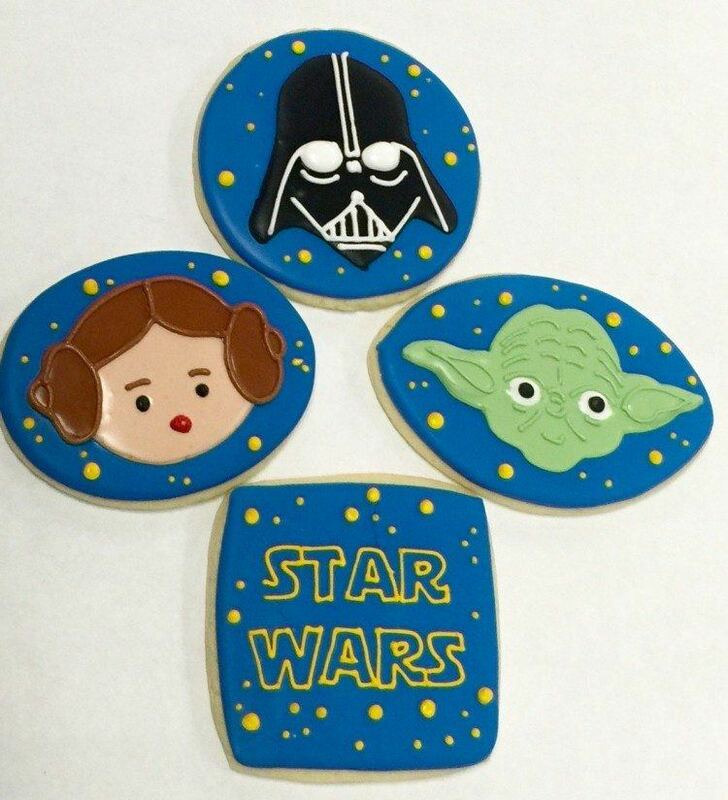 I love the style of these cookies, especially the stars in the background. 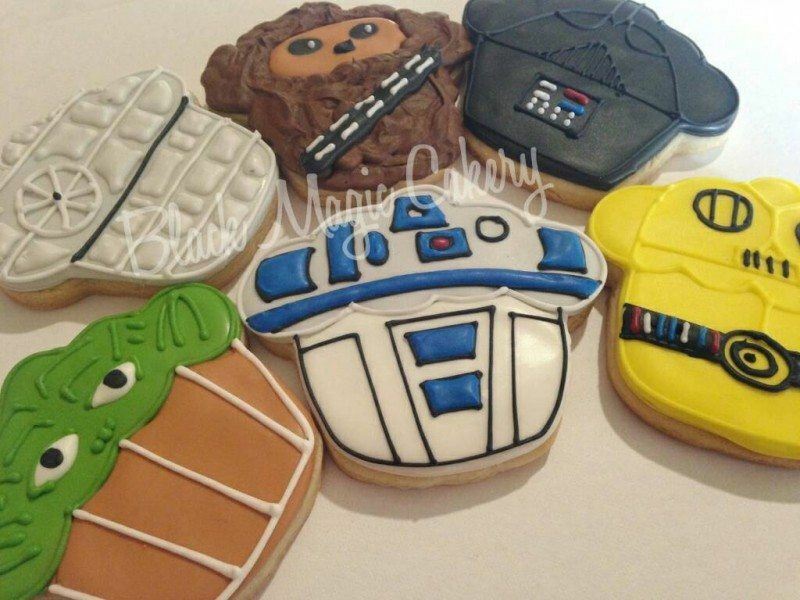 Most of the cookies on this list have their designs put in place with icing, but these cookies take a different approach and it's one that works well. 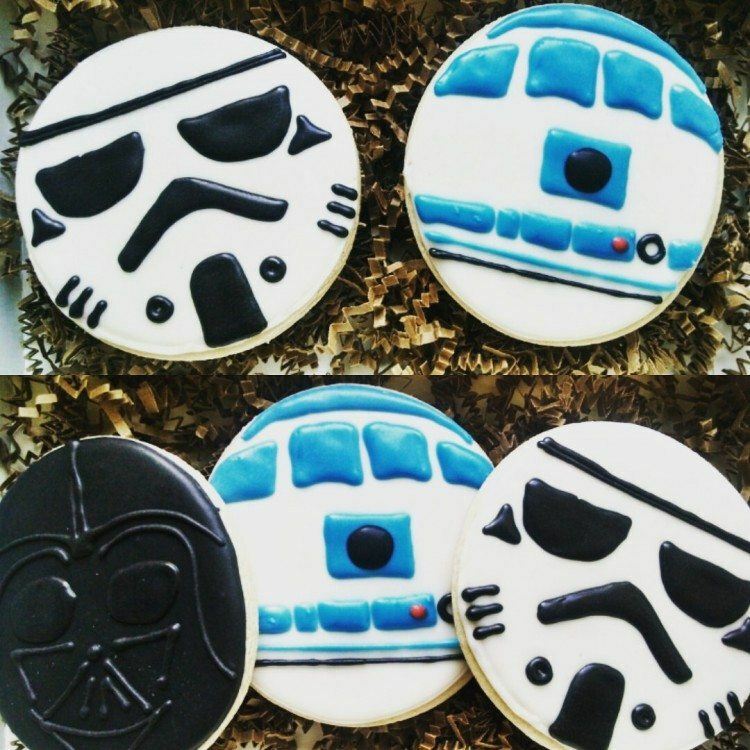 The design style on these cookies is unique, but the style does work pretty well. Cupcake styled cookies is a bit of an odd choice. If nothing else, they are certainly unique. This type of stencil design really is striking although I think the two store owners might be using some of the same stencils. 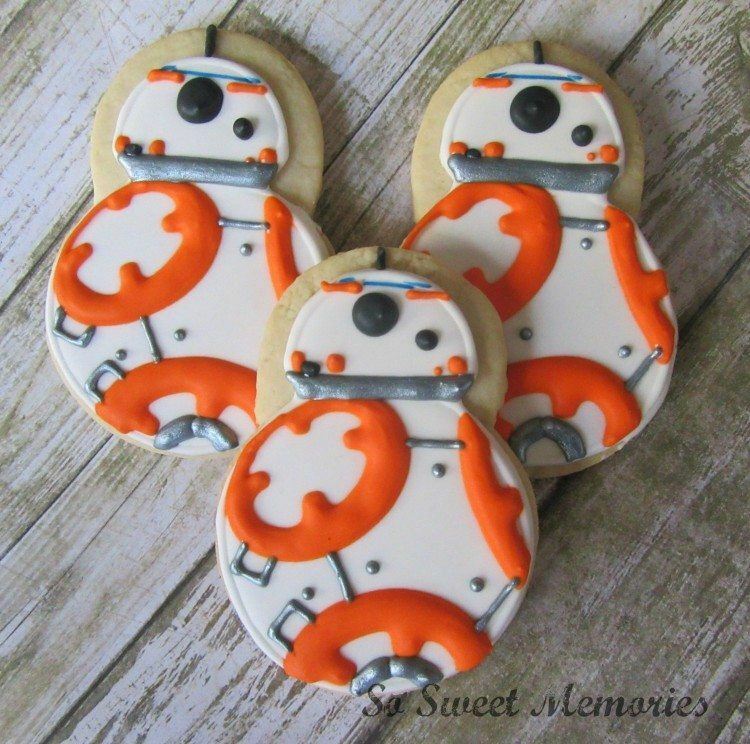 These cookies get the design for BB8 absolutely perfect. 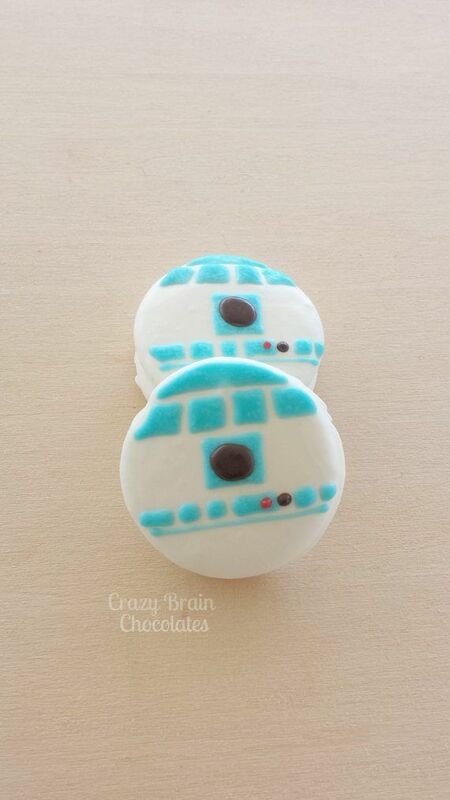 Collections of different cookies like this one are really good because of their variation. 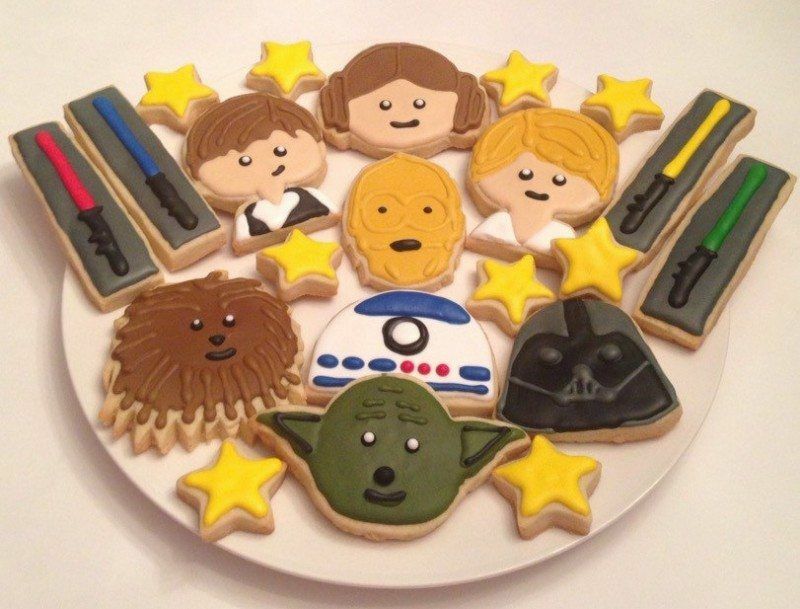 Also, do you see the Han and Leia one in there, that's seriously cute.